Buzzstormer is a 2-vs.-2 minigame in Mario Party 7. Its name is possibly a pun on "brainstormer". 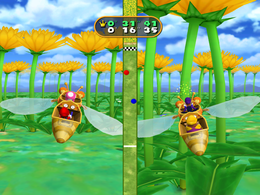 In this minigame, both teams of players are in large bee-like aircraft, and need to get through a forest of large flowers. Hitting a flower's stem will paralyze a team's aircraft for a few seconds, giving the other team a chance to get ahead. The first team to get to the end of the flowers is greeted by a large cliff and an open field, and wins the minigame. Rules – "Move left and right to avoid the dandelions." Advice – "Move in the same direction as your partner to make the bee tilt more." If the team doesn't hit anything, then they are guaranteed to get a time of 19"45 (in the NTSC/60Hz version)/23"34 (in the PAL/50Hz version). In both cases it is equivalent to 1167 frames. Funderwall! • Funstacle Course! • Magmagical Journey! • Slot-O-Whirl! • Treasure Dome! • Tunnel of Lava! This page was last edited on August 4, 2017, at 14:33.